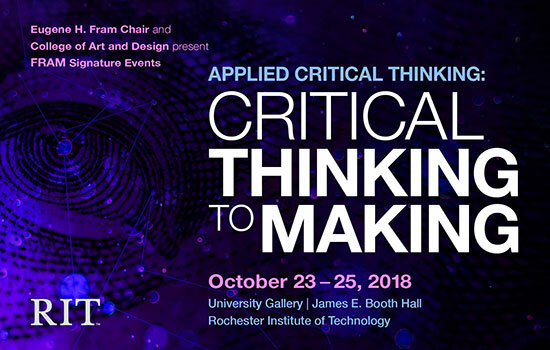 The College of Art and Design-Rochester Institute of Technology's creative hub where art, design, science and technology intersect-will explore how artists and designers can use applied critical thinking in the creative process during "Applied Critical Thinking: Critical Thinking to Making," the 2018 FRAM Signature Lecture and Events on campus next week. The Oct. 23-25 event-co-hosted by the College of Art and Design and RIT's Eugene H. Fram Chair-will feature a series of collaborations and workshops that delve into the creative process in critical and analytical thinking through the use of art, design, photography, animation, visual storytelling, free-form drawing and guided visualizations. The collaborative sessions on Oct. 23 will be presented by Marco van Hout, a renowned designer, educator and speaker who will deliver the FRAM Signature event's keynote lecture, "Applied Critical Thinking: Design for Transformation, Needs a Transformation in Design" from 4 to 5:15 p.m. Oct. 24 in Webb Auditorium inside Booth Hall. A reception with van Hout will follow from 5:15 to 7 p.m. in University Gallery. The keynote lecture is open to the public and interpreting services will be provided. Student registration is highly encouraged. "Critical Thinking to Making is a celebratory demonstration of the strong connection between applied critical thinking and the creative process," said Chris Jackson, professor and associate dean in the College of Art and Design. "This three-day showcase of student work and collaborative workshops will encourage RIT students to be lifelong learners and creative problem-solvers who can live and work effectively in a world of constant change." In his talk, van Hout will argue that people should not only create change, but aim for transformation, according to Jennifer Schneider, the Eugene H. Fram Chair in Applied Critical Thinking and professor in RIT's College of Engineering Technology. "We are very pleased to host Marco van Hout here at RIT because his way of thinking demonstrates the broad application of critical thinking-using information, developing a point of view, complex problem-solving and ultimately creating," Schneider said. "By being creative, but similarly by being critical about how we document, share and use that creativity, Marco believes that we can transform the world-by design." On Oct. 23, van Hout will host three workshops offering RIT students from colleges across the university the learning and direct experimentation of creative processes, methods and techniques to visually synthesize a possible solution to one of the sustainable development goals adopted by the UN by 2030. The goals include people, planet, prosperity, peace and partnership. He argues that there is not a real culture of sharing in the design field, that people suffer from "design waste" and he has been on a mission to fight it for the past years, for example, through Global Goals Jam and Design Across Cultures initiatives within the Digital Society School in the Netherlands where van Hout serves as head of programs and impact. The College of Art and Design will offer three critical making workshops on Oct. 25 that will allow students to participate in the creative process and critique in a convenient, short format. Taught by professors within the College of Art and Design, the workshops are open to all RIT faculty and students, regardless of artistic experience, to explore their creativity. All of the critical thinking collaborations and critical making workshops over the three days will take place in University Gallery and Bevier Gallery inside James E. Booth Hall. A showcase of student work from various schools within the College of Art and Design will be on display in University Gallery and Bevier Gallery on Oct. 23 and 25. The three-day event runs from 9 a.m. to 3 p.m. Oct. 23; 9 a.m. to 1 p.m. Oct. 24; and 9 a.m. to 2 p.m. Oct. 25. Like the collaborations and workshops, the showcase is open to the RIT community. The Eugene H. Fram Chair in Applied Critical Thinking was funded in 2011 by an anonymous RIT alumnus who donated $3 million to honor Fram-the J. Warren McClure Research Professor Emeritus of Marketing who retired from RIT in 2008 after 51 years of teaching at Saunders College of Business. Begun in 2012, the Fram Signature events are the most visible example of RIT's commitment to developing applied critical thinking across the university.